Today we are so technologically-minded we can hardly remember a world where everything was not accessible at the click of a mouse, where a desired item was not instantly purchasable online, but took days,weeks, months to create. Yet scarcely two or three generations back, it was the way we all lived. If you wanted something — be it a field cleared or a coat mended — you did it yourself. If you were an artist, a craftworker, you spent long hours at your easel or workbench, creating something of beauty. Ireland was renowned for its exquisite crafts, and many a household relied on the income brought in by the making of lace. Among the treasures lost on that last ill-fated voyage of the Titanic were handmade Irish lace blouses, purchased in Cobh on the ship’s final call. They would be priceless today. In an age, though, when we can see comparatively inexpensive machine-made versions in any huge department store, should the painstaking and time-consuming traditional craft of handmade Irish lace be forgotten, or at least consigned to the realm of gentle hobbywork? One doughty Irish artist doesn’t think so. 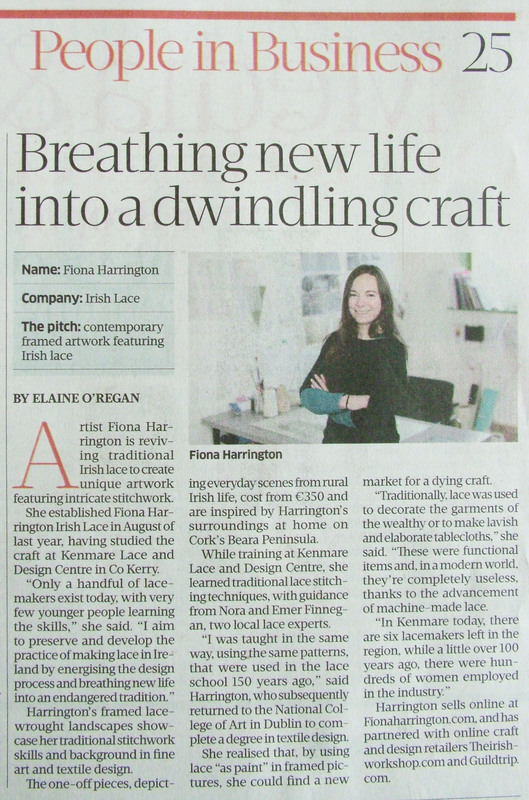 Recently, Beara-based artist Fiona Harrington has been making considerable waves in the age-old world of lacemaking, showing how an old craft can be combined with new ideas, creating stunningly different visual pieces. 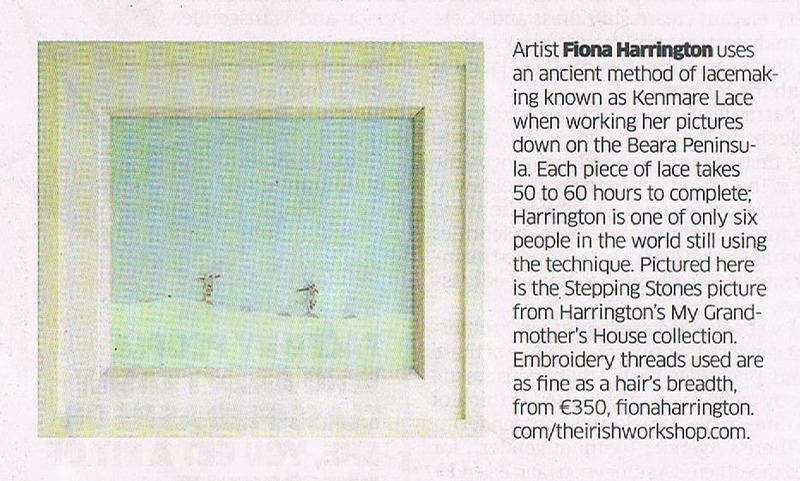 Ms Harrington, who graduated in fine art painting from the Crawford in Cork in 2001, spent a decade living and painting both in Beara and in New Zealand. Her work was exhibited extensively, and purchased by many private collectors as well as by public bodies. 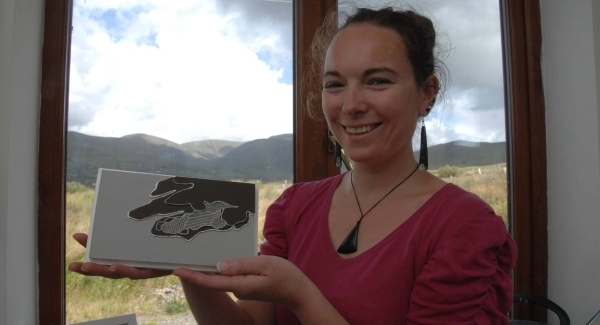 Her creative instinct saw how both her skills could be combined to create something entirely new. And it worked. 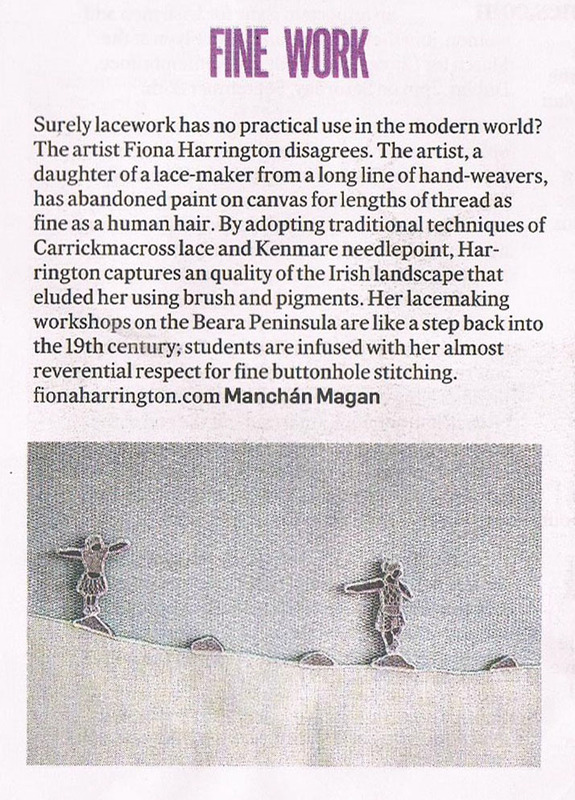 In 2013 she won the prestigious RDS Graduate Prize and this year, first prize in the lace category and the Eleanor De La Branchardiere award for innovative lace design, both at the National Craft Awards in Dublin. This was for a unique miniature piece which encapsulated the rugged West Cork coastline in a myriad different lace patterns. “It was what I always saw from my window, the different textures in the fields, the hedges, the cliffs, and I worked out how to recapture that in the stitchery.” The finely-worked piece, tiny yet so detailed, is a truly amazing work of art. 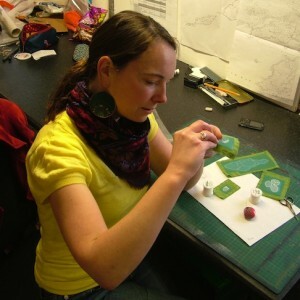 The little pictures hanging on the wall in her studio almost leap off into your hands, begging to be taken home. A tiny lost lamb, a magical miniature Irish oak tree, a splendid fox — all set in misty backgrounds which demonstrate clearly the artist’s grasp of presentation. “I don’t want our proud tradition to be forgotten. I see this as a way to develop it, to carry it on,” says Harrington. -[url=www.fionaharrington.com/]. 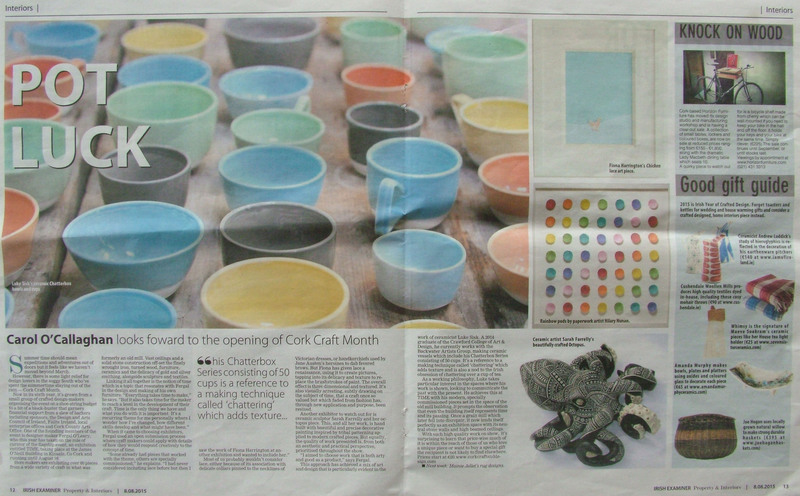 Her new collections can be seen at The Sarah Walker Gallery in Castletownbere, Co Cork, and Cleo in Kenmare, Co Kerry.